Domo Domo has a decent variety of sake, both by bottle AND by glass. 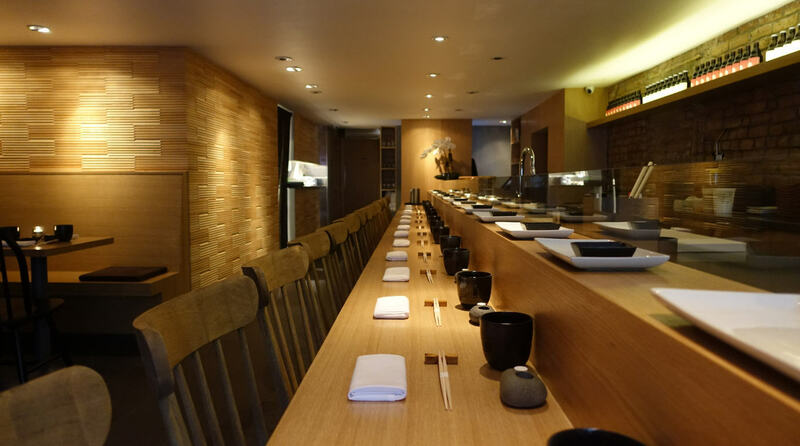 While we’ve been improving, we (NYC) still really don’t have enough sake bars or sushi yas with a bar just yet. I don’t know why more people don’t get on that bandwagon. Sake is the most amazing liquor ever. Quick buzz, and no hangover! How is that not the dream? 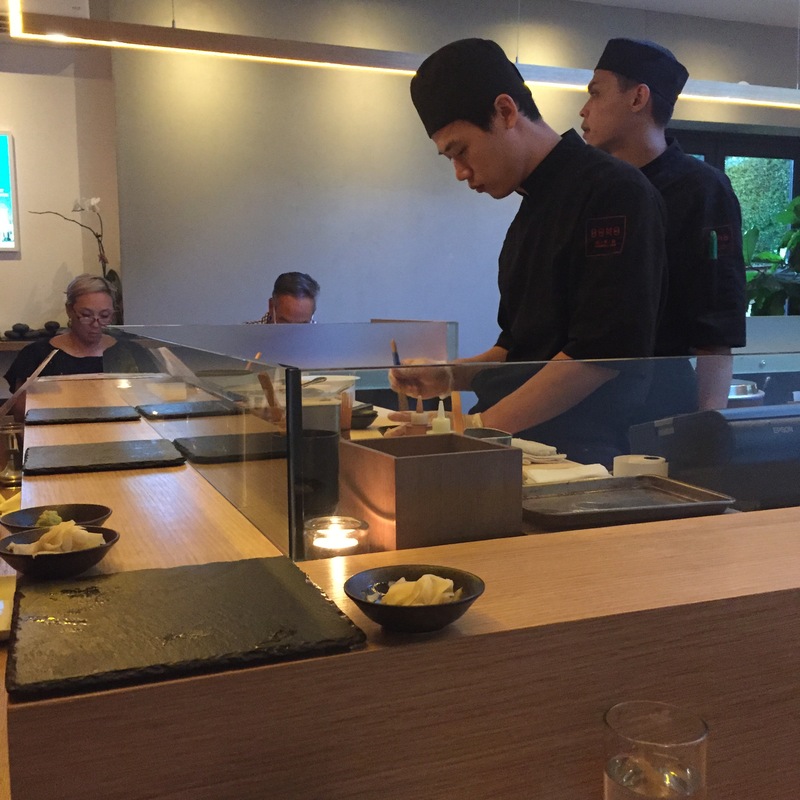 The bar at Domo Domo (the kitchen side, not the sushi bar side) is small, but it will do. They serve the full menu at the bar too, bonus! 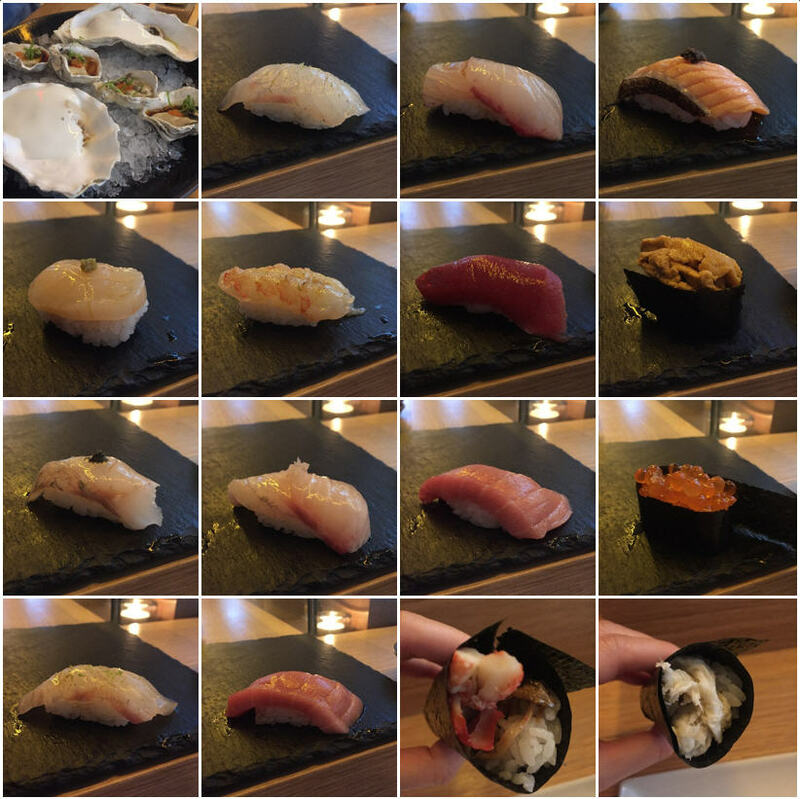 We ended up trying their oyster sampler, and a few hand-rolls. Decent! Decent enough to warrant a trip for a full meal! 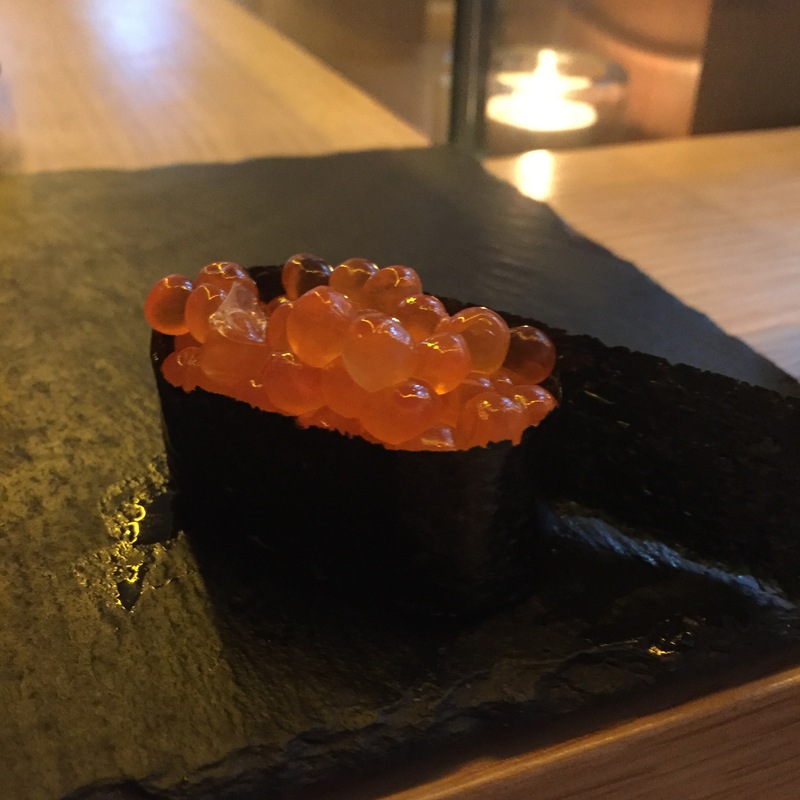 2 Jumbo Oysters with Yuzu (Japanese citrus) foam and Ikura (Salmon eggs) – The foam was much better last time, this time, it was more of a paste, and entirely overpowering. 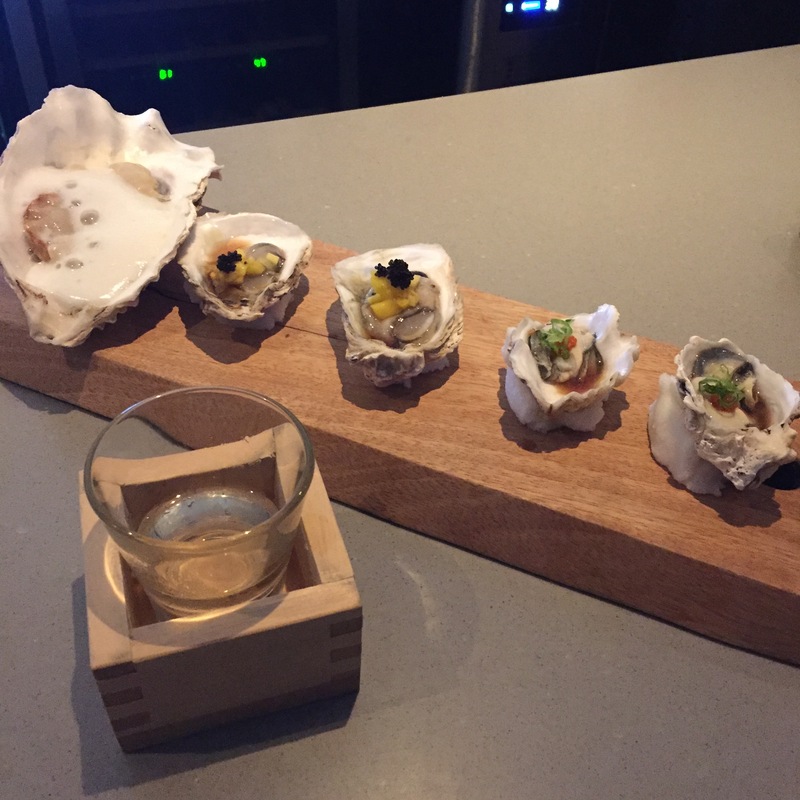 You couldn’t taste the oyster at all. 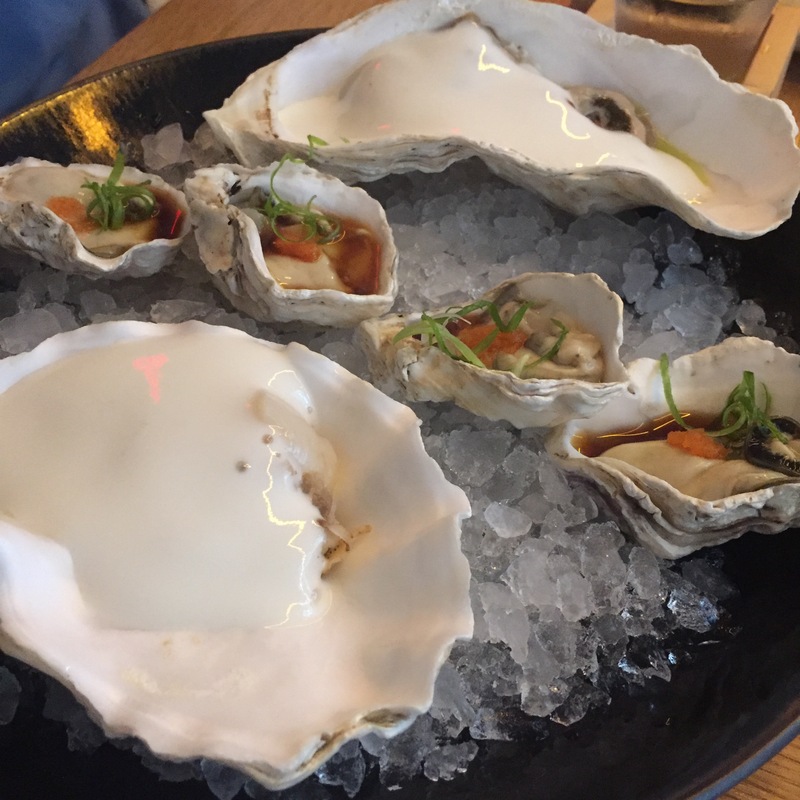 4 Kumamoto oysters with MOMIJI OROSHI (Grated Daikon Radish marinated with red chili pepper) and scallion – these were decent! Red snapper $9 for 2 pieces – Surprisingly good! 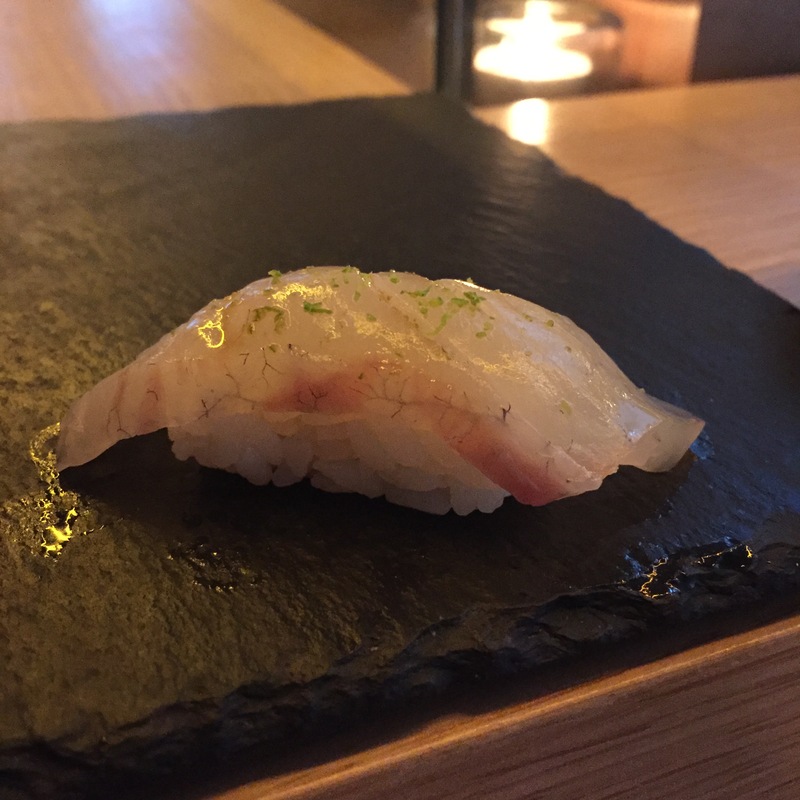 Super light fish, with a very nice little sprinkle of yuzu zest. At $4.50 a piece, what an awesome price! KANPACHI (Amberjack) $12 for 2 pieces – This was supposed to be “house smoked” but there was no hint of smoking of the fish. 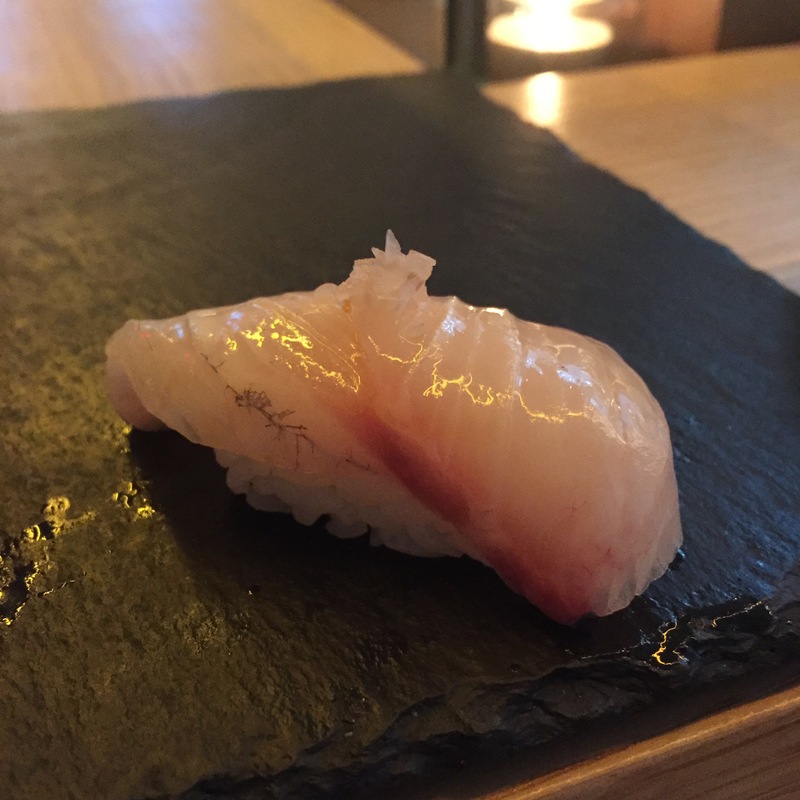 There was no bright crunch that comes with a really great KAMPACHI, but this was still very decent. 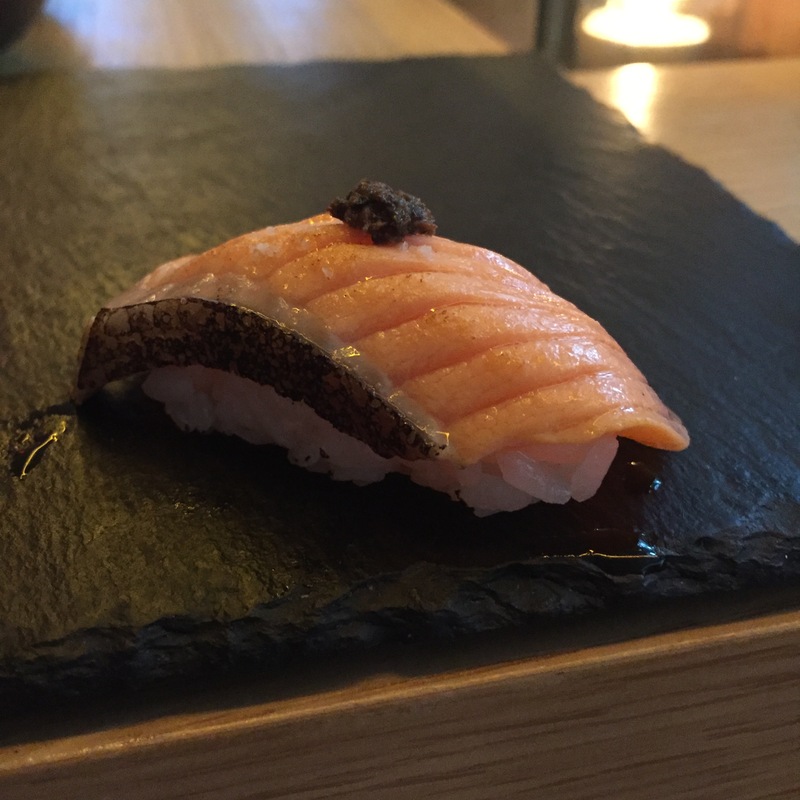 King salmon with truffle salt $11 for 2 pieces – The truffle salt did NOT compliment this fish, and I would definitely prefer this to not be torched. Acceptable, but really would not have ordered if I knew this was the serving. 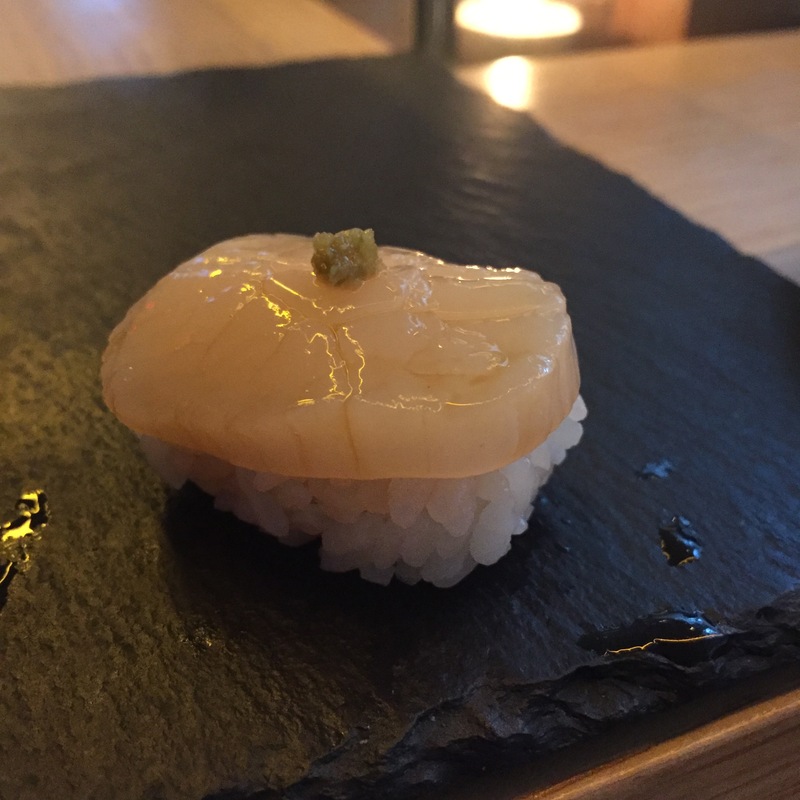 HOTATE (Scallop) $8 for 2 pieces – What would possess anyone to put a jalepeno paste atop a fresh scallop? Completely overpowered the fish. 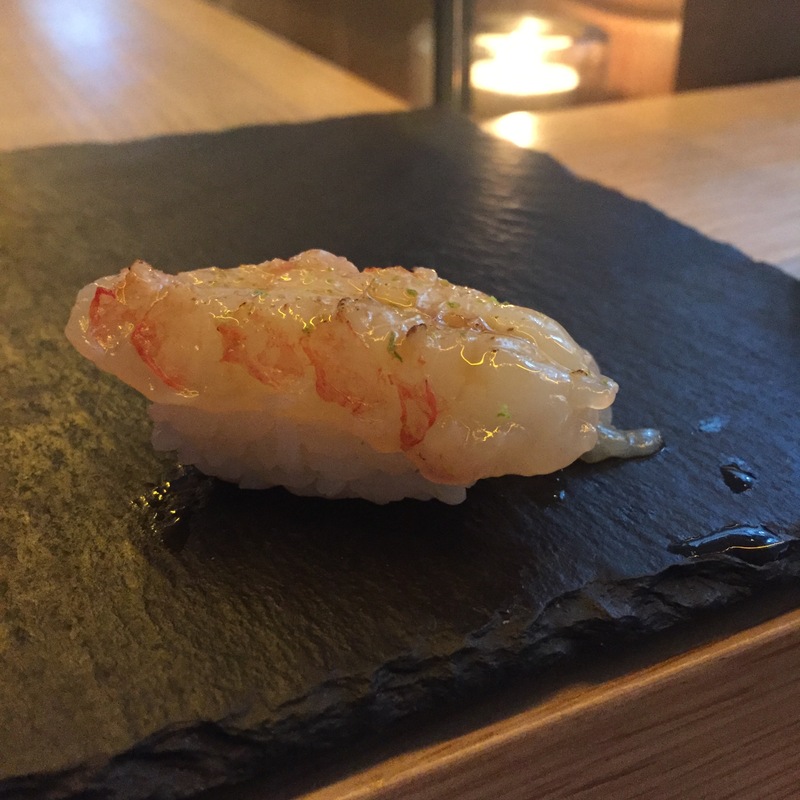 BOTAN EBI (Spot prawn) $15 for 2 pieces – Menu says this would come with UNI, there was clearly no UNI. 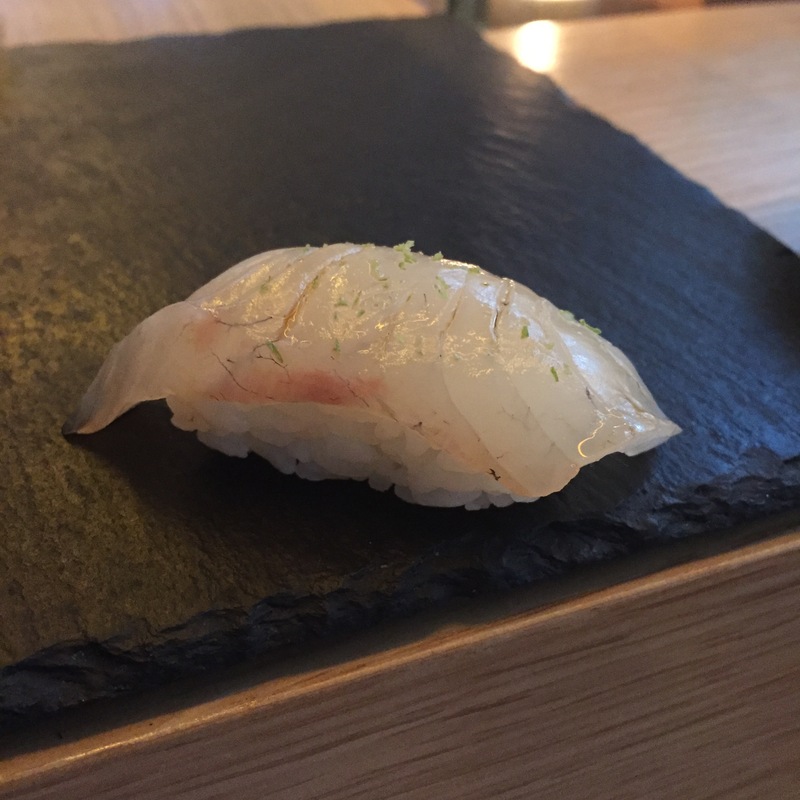 Instead, this was dressed with a little splash of yuzu, and topped with a tiny bit of yuzu zest. The fish itself was NOT good. If I took this in bites, I would not have had the second bite. Yes, that bad. 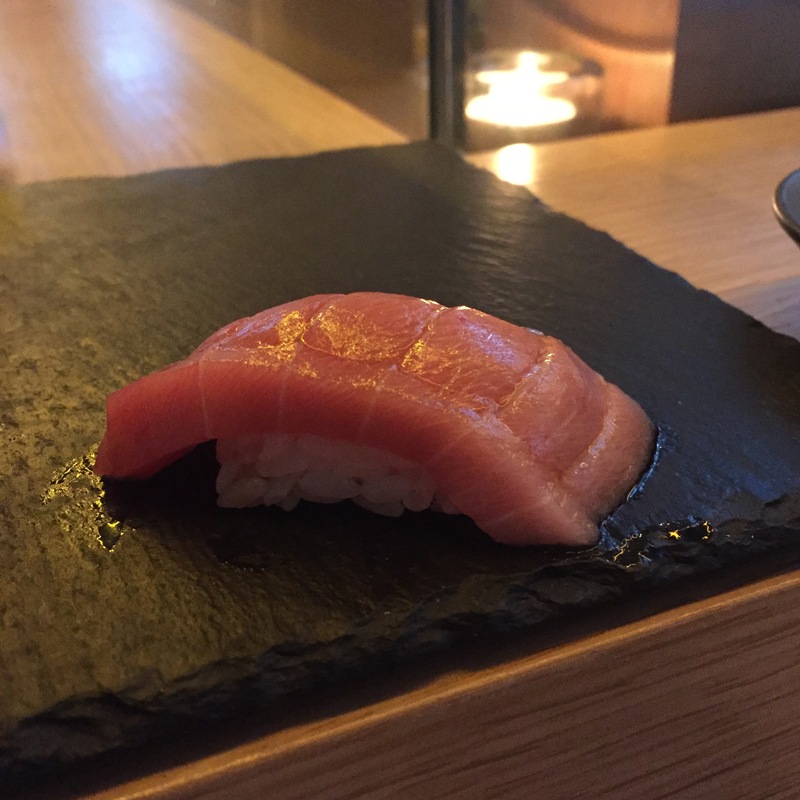 AKAMI (Blue fin lean tuna) $14 for 2 pieces – Very healthy serving! This was very decent, but did have a tiny tinge of not so fantastic aftertaste. Definitely worth a second round though! 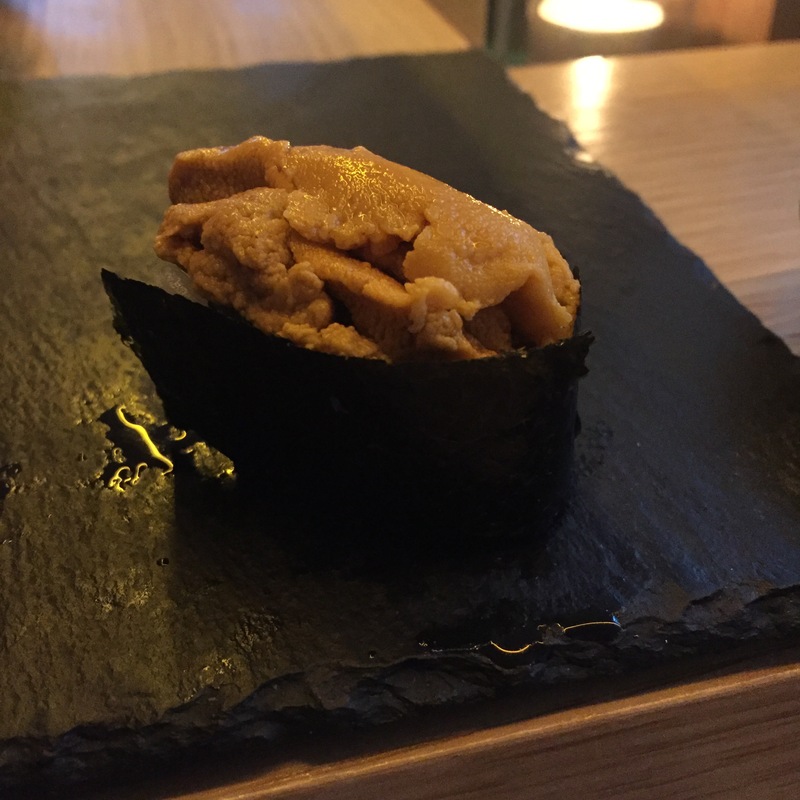 UNI from California (Sea Urchin) $12 for 2 pieces – It doesn’t look bad, but this was GROSS. 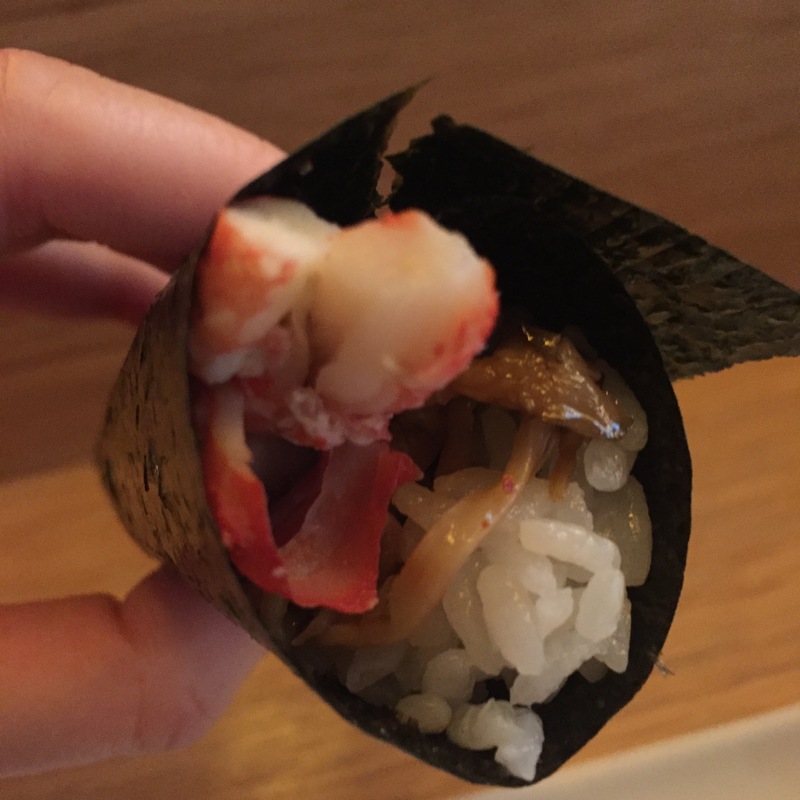 After the bad BOTAN EBI, I got smart, I took a small piece off the top before having the entire bite. I made boyfriend eat the rest. Branzino with SHISO pesto $8 for 2 pieces – Very, very good. Good comeback from that gross UNI. KONA KAMPACHI with pickled shallot $10 for 2 pieces – First bite, KAMPACHI alone, and again, the KAMPACHI was very good quality. YUM. 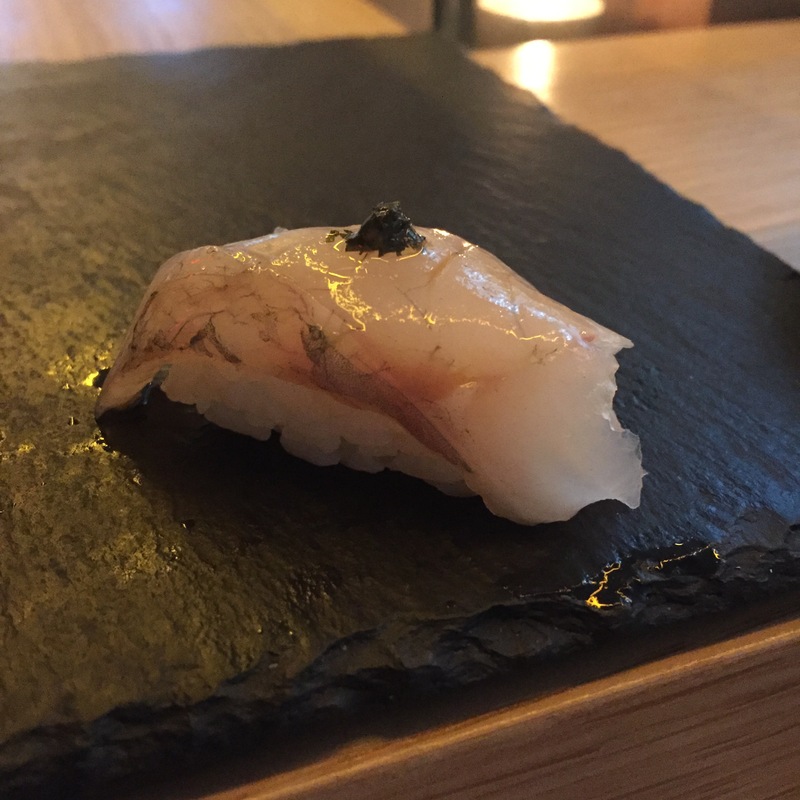 Second bite, KAMPACHI with the pickled shallot, blah! Not a fan of the shallot combo. 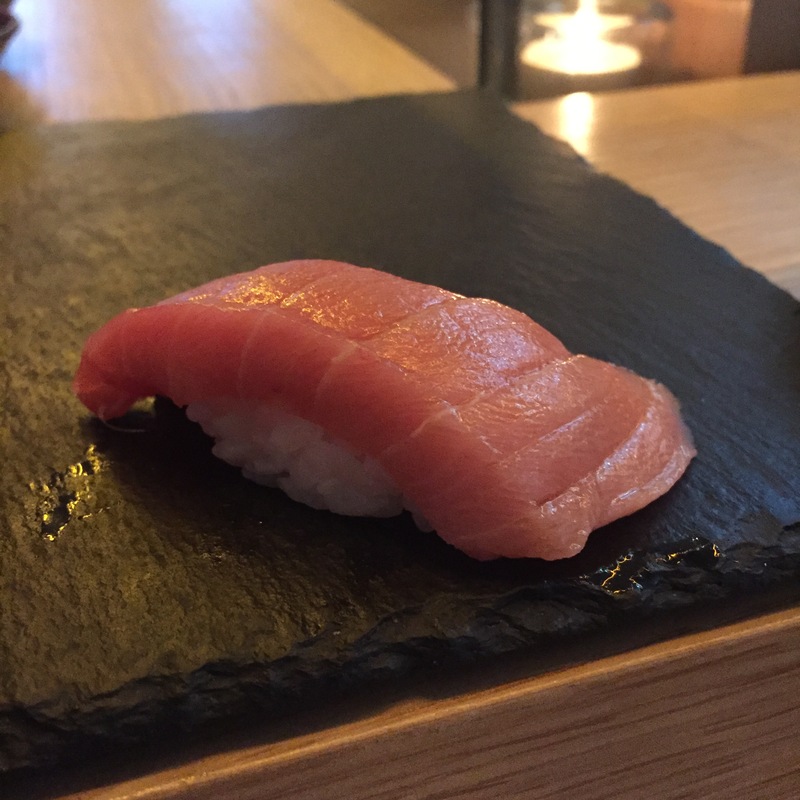 CHUTORO (Medium fatty tuna) $16 for 2 pieces – Surprisingly good! 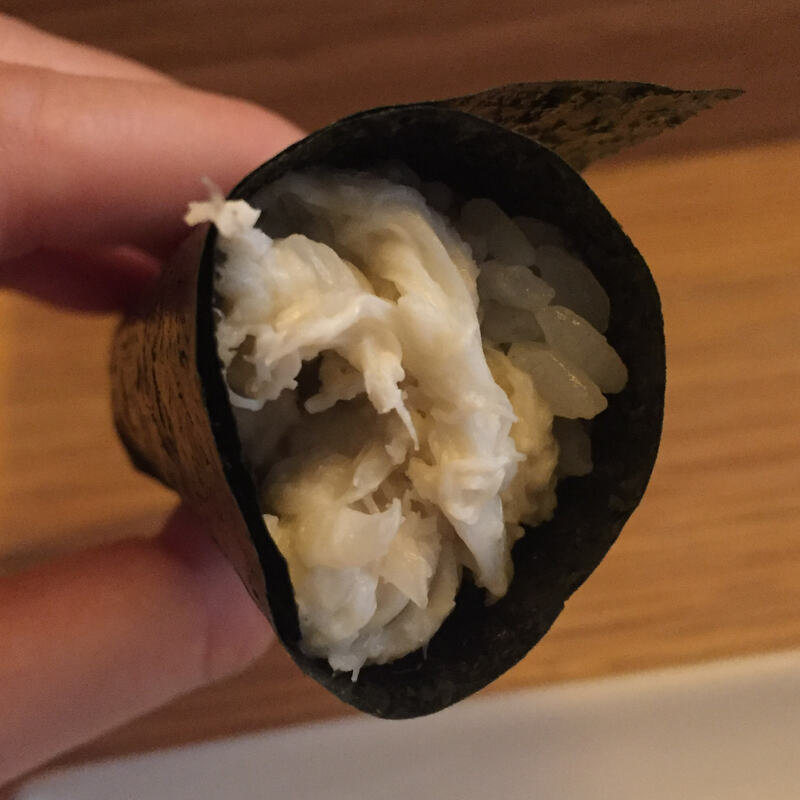 Same as the AKAMI, there was a slight tinge, but it wasn’t strong, it’s like 90% of all high end sushi-yas. It happens. 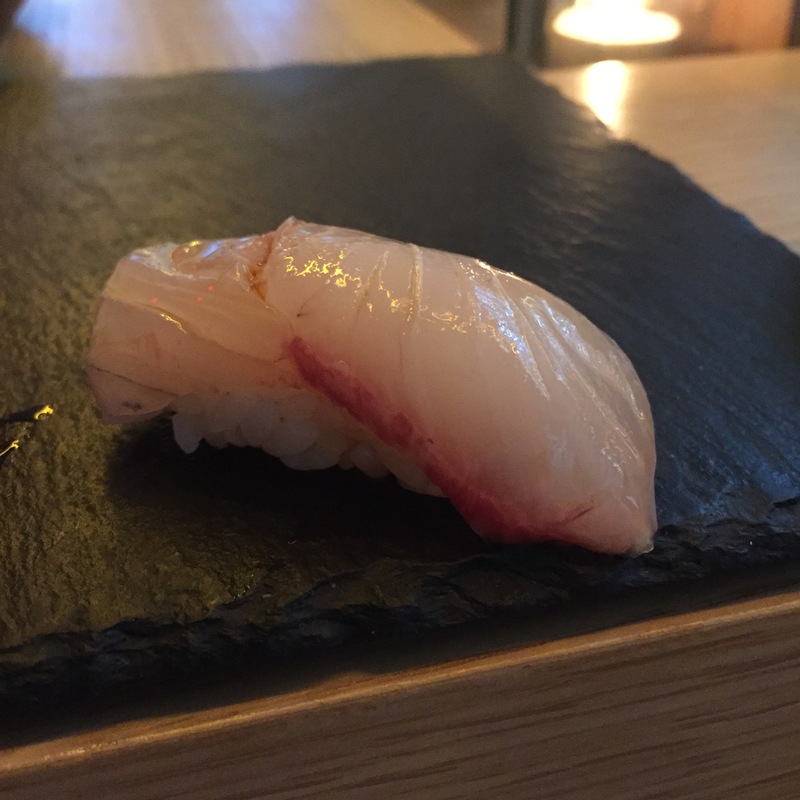 And $8 bucks for a piece of CHUTORO? What a bargain! 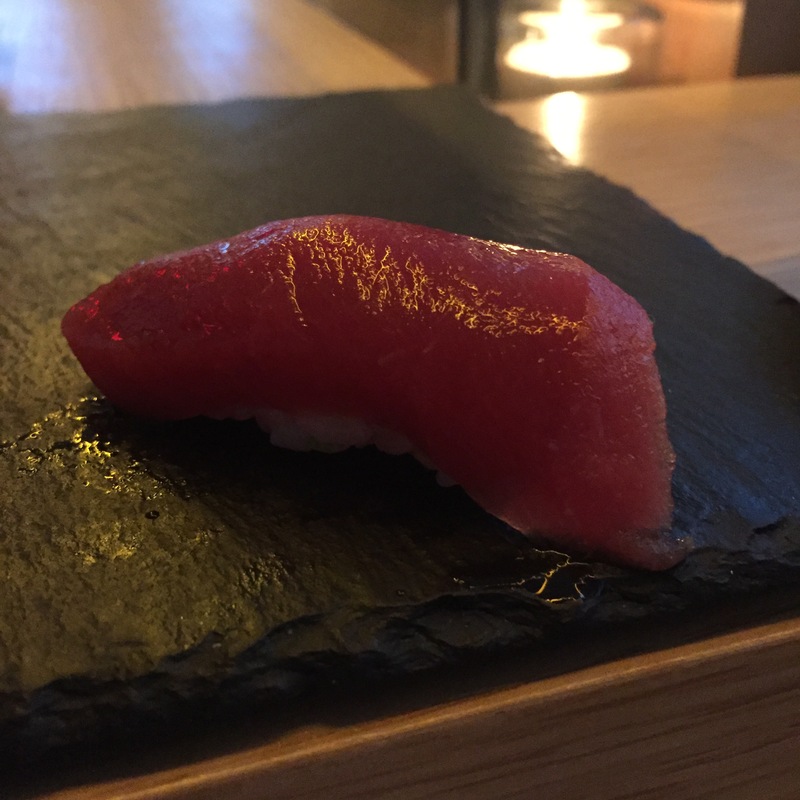 CHUTORO (Medium fatty tuna) $16 for 2 pieces – Same, still very good, definitely the deal of the night! Blue crab with garlic aioli and sautéed onion $8 – This was my fave! 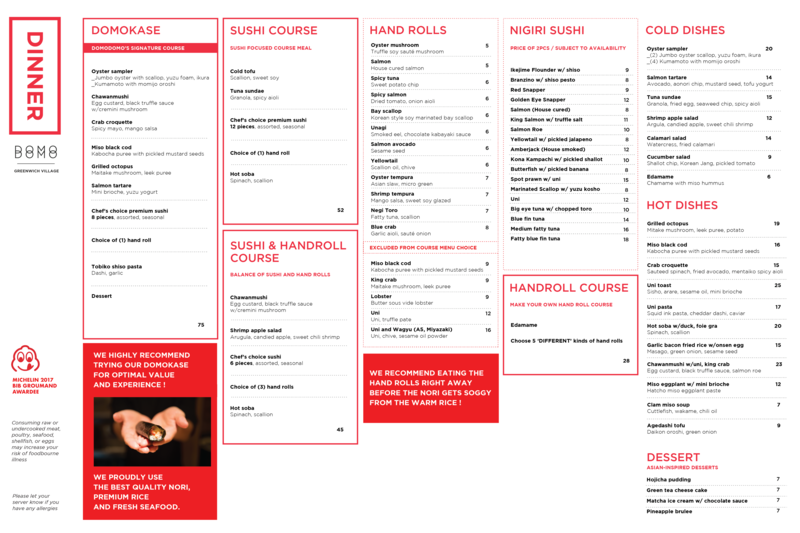 Though not for true sushi connoisseurs (otherwise known as snobs), for the cost, Domo Domo is a crazy value. That’s the mindset you need to go in with. 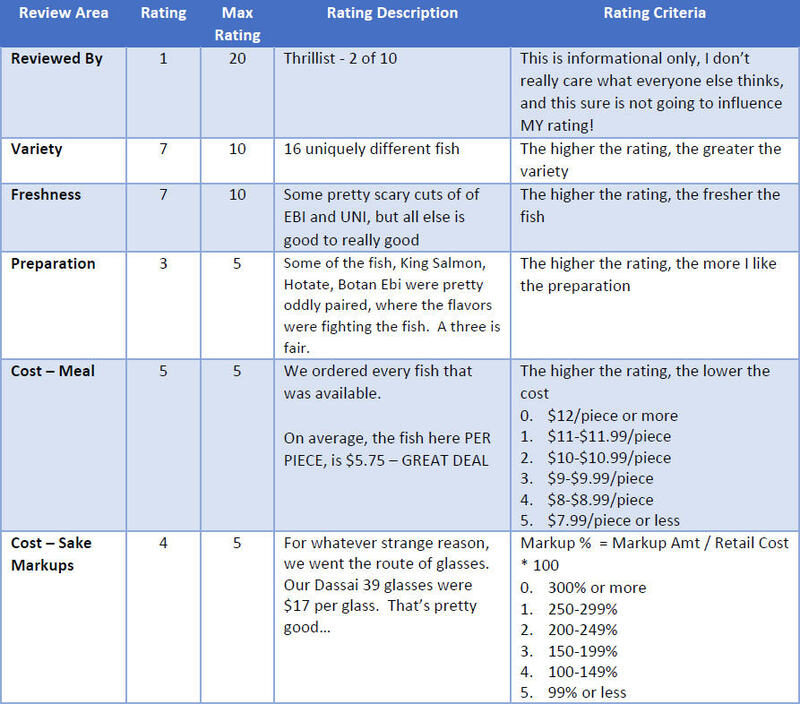 Don’t go for the exotic fishes, don’t go expecting variety, or fish from Japan, fanciness. Go knowing that you can get decent cuts of local fishes for a great price, and enjoy amongst others that won’t know the difference between whites and silvers.